Vessels used by the Bureau of Immigration & Customs Enforcement (ICE) can be subjected to severe conditions during law enforcement operations. 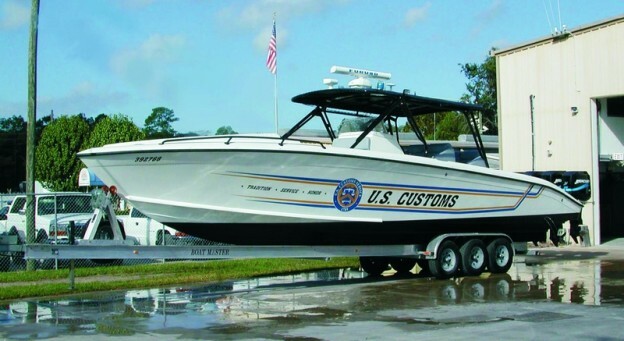 Occasionally, the intense interaction between law enforcement vessel and suspect violators can result in unwanted vessel damage. The damage on this ICE interceptor was the result of intentional impact by a suspect vessel (Photos 1 and 2). 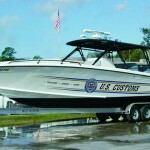 This vessel was sent to the ICE National Marine Support Center (NMSC) in St. Augustine, Florida. The NMSC site is operated by Global Marine Systems Inc, the national marine maintenance contractor for ICE. 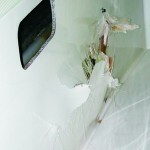 The port hull and inner liner were significantly damaged as a result of the impact. The damage was assessed and determined to be repairable as no major structural components were compromised. All damaged sections were removed. The outer hull was cut and trimmed to allow access to the inner liner and a small section of the deck, which also had to be replaced (Photo 3). Interior components were inspected to locate hidden damage (Photo 4). Precise measurements were taken of the damaged area. 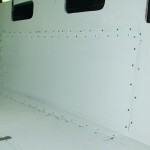 Global Marine Systems then contacted the vessel manufacturer (Midnight Express) to fabricate panels with the identical schedule and compound curves. The replacement panels were ordered slightly larger than the actual damaged area. This facilitated exact trim-to-fit panels. 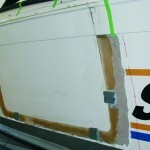 WEST SYSTEM® epoxy was used to bond the new panels in place (Photos 5 and 6). The final repair stage included graphic application (Photo 7). Sea trials were performed in extremely rough conditions. After several hours of operation, a determination was made to return the vessel to operation. To date, the vessel has over 100 hours of mission time with no failure. 1. 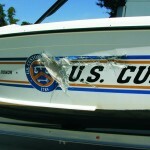 The damage resulting from intentional impact by a suspect vessel. 2. The damage up close. 3. 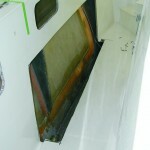 The outer hull was cut to allow access. 4. Interior components were inspected for damage. 5. WEST SYSTEM Epoxy was used to bond the new panels in place. 6. New panels bonded in place. 7. 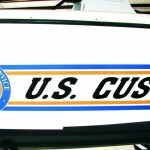 The U.S. Customs graphic was restored after the repair was completed. 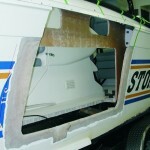 This entry was posted in Fiberglass Boat Repair and tagged 21, Epoxyworks #21, Rich Simms, Spring 2003, U.S. Customs on November 29, 2014 by ewadmin.